Stine Moen, left, and Hitomi Nozawa of Shirdance in New York greeted the crowds at the 42nd annual Westport Fine Arts Festival on Saturday with their "living statue" performance art. 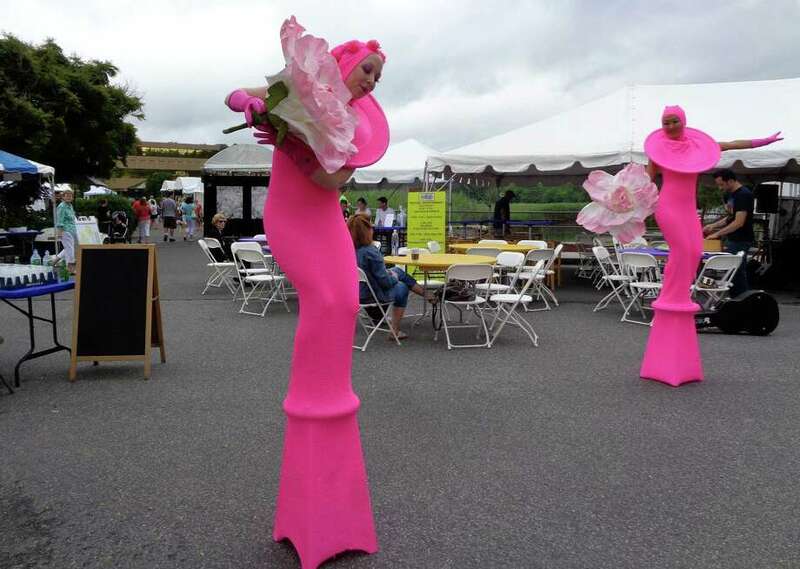 Water seemed to dominate the 42nd annual Westport Fine Arts Festival’s opening Saturday, from the light rain showers that chased away patrons in the morning to the inspiration some artists found in the view of the Saugatuck River from their booths along it. Plenty of the 132 artists echoed the water theme in their juried work including paintings, photographs, sculptures, mixed media, photography, glass, ceramics, wood, jewelry, fiber art and digital art. The event, sprawling along Parker Harding Plaza and Gorham Island, is set for a second day Sunday from 10 a.m. to 5 p.m. In addition to the varied art work, the event features music, street performances, children’s activities and refreshments. John Cheng of Coram, N.Y., displayed mermaids among this other mixed-media works of fairies, angels and ballet dancers. Cheng works with pastels and oils on rice paper. T. Duryea of Darien had paintings of Long Island Sound, as well as Italy, abstract flowers and splatter art. Pavlina Alea of Miami, Fla., a first-time artist in this show, displayed acrylics on canvas of swimmers in the water. Photographer Jonathan Spector, of Lido, N.Y., goes into the water himself to capture his unique images of waves during hurricanes. He mounts a camera on his body, dons flippers and dives in when most people are evacuating from waterfront properties. “I love the shapes of the waves and the colors. You wouldn’t see this from the beach,” Spector said. Corrina Leidy of Hampton, N.Y., didn’t create images of ocean waters or beaches. Instead, her work involves “the art of painting on water” using a marbling technique and fused glass. Sue Brown Gordon of Norwalk, a painter and metalsmith, said she was grateful for the location of her booth along the Saugatuck River on the outer edge of the Parker Harding Plaza. “The fact that they gave me a waterfront view of things I like to paint is an added bonus to the show,” said Brown Gordon. She said she found inspiration in the river. The thousands of patrons who strolled through the festival after the gray clouds moved out, replaced by blue sky and puffy white clouds, gravitated to their favorites. For Sue Walker of Cooperstown, N.Y., and Karen Como of Westport it was the 3-D work of Gerardo Leccese of Charleston, S.C.
“We’re giving you Best in Show, very unique,” Walker said. “It’s brilliant. He combined painting, architecture and photography. It’s amazing how he mixes the three,” Como said. Steve Desloge, president of the Westport Downtown Merchants Association, which hosts the annual festival, and owner and president of Rockwell Art and Framing, said this year’s event featured a number of artists participating for the first time “so for us it’s pretty exciting.” There are many familiar faces among the artists as well. David Oleski, a painter from Westchester, Pa., is a 10-year veteran of this local show. “It’s a great audience, wonderful venue, and always enjoyable being in Westport,” he said. First timers and digitized fiber artists Staci and Bill McLauchlan of Columbia, Md., said they were familiar with the stellar reputation of this show. Desloge said they made another change this year, setting up booths closer together to create a more intimate environment and allowing for more interaction between artists and the public.